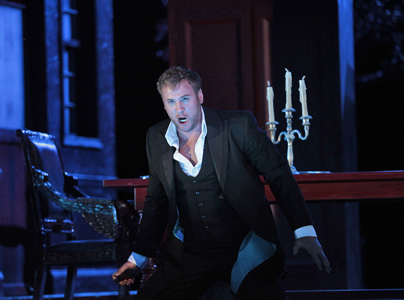 Lucas Meachem (DonGiovanni). Photo: Ken Howard. Ah, Don Giovanni, perhaps the greatest lover of legend, seducer of thousands, portrayed by everybody from Errol Flynn to Johnny Depp. Written about by Byron, Pushkin, Ingmar Bergman and, of course, Mozart. It’s the Mozart version – called by George Bernard Shaw in his critic days the perfect opera – that is onstage in Santa Fe this summer. Written in 1787 and premiered in Prague, the work, part comedy, part tragic morality tale, has endured through the years and still is one of the most frequently-performed operas in the Mozart canon. Here designer David Zinn has painted the stage in all the colors of hell — blood red, fire orange, flaming fuschia. We know where Don Giovanni, that tireless reprobate, is headed before a single note is sung. What we don’t know, however, is why he seems so bored. Lucas Meachem infuses his characterization with such ennui that his misdeeds seems to be all in a day’s work. Since he can’t get excited about them, it’s kind of hard for the audience to get all worked up. Whether this is attributable to the singer or director Chas Rader-Shieber is hard to determine. Meachem looks the part, sings very well but could do with a bit more swash and buckle. Everybody else in the current Santa Fe Opera production contributes plenty of energy to keep the long night going (Why don’t they cut some of the recitative? Yes, Mozart is sacred but it’s not Holy Scripture!) Matthew Rose makes a fine and funny Leperello, Giovanni’s servant-sidekick and keeper of the list of his conquests. In fact, his boss could use a bit of his swagger. The women: Elza van den Heever as the wronged (maybe) Donna Anna, Susanna Phillips as the deserted (definitely) Donna Elvira and, especially Kate Lindsey as the bride-to-be Zerlina, current object of the Don’s insatiable lust, are terrific. Charles Workman makes Don Ottavio, sometimes cited as the most boring character in all opera, a figure of sympathy and interest. He sings beautifully and injects some strength into the wimp. Even Masetto, Zerlina’s hayseed bridegroom shows some spirit in the capable hands of Corey McKern.